If you’re looking for professional service in Chicago or the surrounding areas on Cranes, Bucket Trucks, Piggyback Forklifts or Aerial Lift Equipment, then look no further. We make customer service our top priority and will make sure to do everything possible to keep your equipment running efficiently. 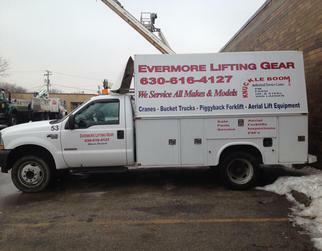 Evermore offers electric and hydraulic diagnostic services to help troubleshoot what is wrong with your equipment. We provide on-site support, or you can stop by our warehouse. We provide full repair services for all makes & models. Call us today to ensure your equipment is inspected properly. We offer OSHA Annual and Periodic Inspections as well New Crane Inspections for new purchases.